This is a gathering of girls! 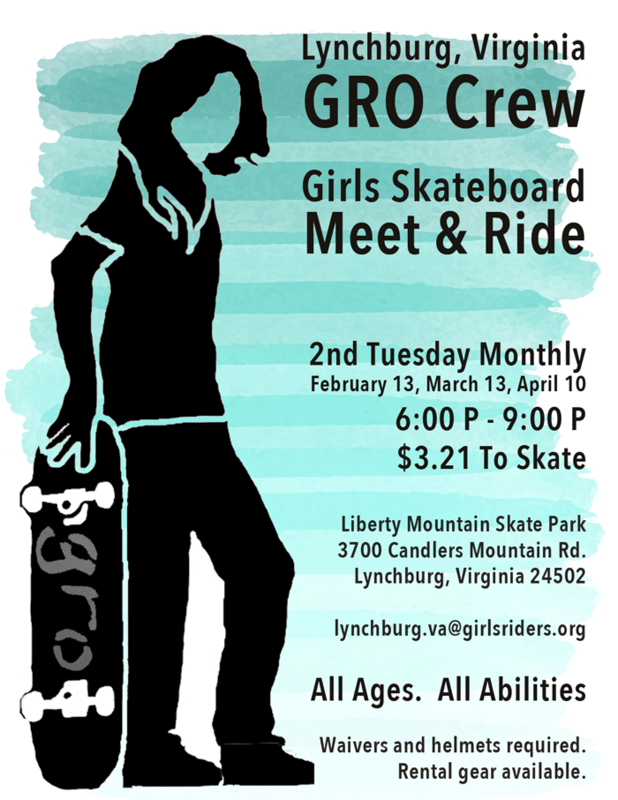 Girls of all ages and all skateboarding abilities can come together at this event to grow both through skateboarding and creating goals for this crew of girls and how they can make an impact on the Lynchburg Community! The event begins at 6 pm and people can participate in as long as their schedule allows. Here you can skate, or learn about skateboarding in a positive and comfortable environment with a group of girls. You can also get involved by volunteering, taking photos or videos to share the story of the Lynchburg, VA GRO Crew and other ways too. Bring your own equipment if you have any, but the skatepark does have rental gear available. Waivers are required to skateboard. If you are under 18 and do not already have a waiver on file you will need a parent or legal guardian to sign the waiver. $3.21 fee to skate the facility. Be active, have fun and explore how amazing you are!